One of Berkeley's most popular shopping districts is Fourth Street. On Fourth Street in Berkeley you will find many independent stores, chain stores such as Restoration Hardware and Sur La Table, and a good mix of restaurants. The Paper Source, on the corner of Hearst and Fourth Street is an incredible store for cards, wrapping supplies and crafts. They also offer craft classes in the store. For more info, click here. Impress your friends and yourself by learning how to make a traditional drop spine box. You'll learn to craft a box from scratch using archival bookboard and then cover it with precut decorative papers and bookcloth. 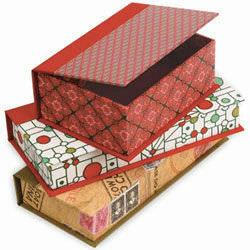 By the end of this workshop, you'll have a multipurpose 5" x 7" box, perfect for photos, recipes & more. Prior experience with basic tools such as a cutting knife and ruler is desirable. This image represents samples made in this workshop conducted around the country. Please visit your local store for current class samples.